Personally, I don’t recommend any of these options as a resolution to calm those hacking, lung-wrenching coughs coming from your chest. And it might surprise you to learn that the American College of Chest Physicians doesn’t recommend them, either. In fact, this prestigious group reports against the use of over-the-counter cough and cold medicines to control your cough. 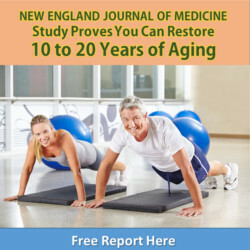 They also lean away from the use of nonsteroidal anti-inflammatory agents. On top of that, they say there is absolutely no evidence to support the use of cough suppressants, expectorants, mucus thinning agents, antihistamines or any combination of these products for reducing cough. Why do you cough in the First Place? Here’s the thing. On average, a typical cold-related cough lasts for about three weeks … sometimes even longer. And there is a reason for that. Coughing is a protective measure. It is one of the strongest if not the strongest reflex in the body. It’s a mechanism designed to break down mucus and get it out of your lungs when you’re sick. As you expel this mucus, whatever viral, bacterial or other infection that started your symptoms in the first place is forced out of your lungs. Over-the-counter meds won’t speed that process up. Plus, some of the ingredients found in them are decidedly bad for you. One of the worst is something called dextromethorphan. On labels you might see it listed as DM or DXM. This cough suppressant has all sorts of weird side effects that can leave you feeling shaky, nervous, restless and drowsy – all at the same time. Antihistamines may contain anticholinergic compounds associated with dementia and loss of mental faculties. The FDA warns that NSAID pain relievers can increase your risk of heart attack or stroke in just a matter of weeks. If these medications do nothing to speed recovery or tame your cough, why take them in the first place? That being said, your best bet is to naturally alleviate symptoms by thinning down all of that mucus build-up that triggers your cough reflex. One of the best ways to loosen mucus is to keep your mucus membranes moist by drinking plenty of liquids. But I’m not talking about the sweet and sugary kind. Refined sugars are very pro-inflammatory, which will increase the production of mucus. A tall glass of water several times a day will do you a world of good. Hot tea or warm water with a little ginger, honey and lemon are even better. The steam from these heated beverages helps break down mucus even further. At the same time, they contain multiple anti-inflammatory compounds that may help control coughing. Good, old-fashioned chicken soup is especially good for breaking up mucus and soothing a cough. That’s because the ingredients help reduce the inflammatory response that triggers the release of mucus. Taking 15 minutes of breathing in a steamy shower will also help loosen up all of that thick gunk that makes you want to cough. One of the tricks I learned a long time ago is to place a few drops of eucalyptus or menthol oil in a small container and place it into the shower. Place it in an area where the shower spray won’t wash it away. As the steam from the hot water releases the vapors, it will help clear out your throat and sinuses. You don’t even have to get in the shower, you can just sit on the toilet seat and breathe. Post-nasal drip after a cold or flu can cause a back-up of mucus in the throat that makes you want to cough. This is another symptom that your immune response is still in overdrive… trying to get rid of foreign invaders in the throat and nostrils. Try flushing your nasal passages with a probiotic sinus rinse. This will infuse your nostrils with healthy bacteria and help displace those that aren’t so healthy. Just mix a regular probiotic capsule with 8 ounces of saline solution. Then, use a neti pot or rubber ear bulb to gently flush each nostril with the formula before bedtime each night. Malesker MA, et al. 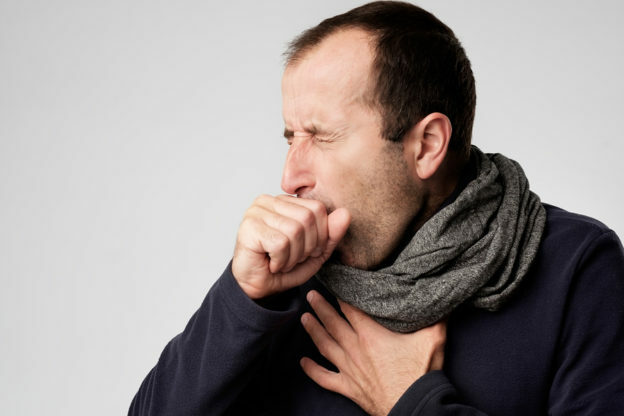 Pharmacologic and Nonpharmacologic Treatment for Acute Cough Associated With the Common Cold: CHEST Expert Panel Report. Chest. 2017 Nov;152(5):1021-1037. Gray SL, et al. Cumulative use of strong anticholinergics and incident dementia: a prospective cohort study. JAMA Intern Med. 2015 Mar;175(3):401-7. American College of Chest Physicians. “New Study Supports Chicken Soup As a Cold Remedy.” ScienceDaily. Oct 2000.